Delegates stand outside the plenary session hall at the ASEAN Summit in Vientiane, Laos, Sept. 6, 2016. This week leaders from Southeast Asia, the United States and China are meeting in Laos for the first time since July landmark ruling by a U.N.-backed tribunal rejected China's vast claims to most of the South China Sea. Addressing the maritime dispute is among ASEAN's most important issues, however this year there is little expectation that the Summit's concluding joint statement will even mention the tribunal's ruling. Ben Rhodes, deputy National Security Council adviser to President Barack Obama, tells VOA that although he hasn't seen the draft statement yet the U.S. doesn't expect the ruling to be part of it. "What we have been focused on is not the ruling, given the diversity of views on that topic. We have been focused on the principles that were in Sunnylands," he said, referring to the U.S.-ASEAN Summit at the Sunnylands estate in Rancho Mirage, California, which took place in February. "We think those are important issues that need to be a part of the agenda both in ASEAN meetings and on East Asia summit." 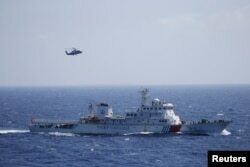 At the February meeting, Obama called for "tangible steps" to lower tensions over ongoing territorial disputes in the South China Sea and said regional leaders had affirmed that disagreements should be resolved peacefully, through legal means. China, the Philippines, Taiwan, Vietnam, Brunei and Malaysia all lay claim to parts of the disputed region. Many have hoped that ASEAN can provide a framework for resolving the disputes, however the group has been unable to bring the parties together, in part because China insists on negotiating one-on-one instead of through multilateral settings. In July, the U.N. arbitration court dismissed China's territorial claims in the South China Sea, saying it has "no historic title" to the vast maritime region. The ruling by the Hague-based Permanent Court of Arbitration answers a complaint brought by the Philippines in 2013 that accused Beijing of violating the U.N. Convention on the Law of the Sea (UNCLOS) with its aggressive actions on the Scarborough Shoal, a reef located about 225 kilometers off the Philippine coast. Rhodes said that the ruling is not what the U.S. has been focusing on, and that there are other important issues that need to be a part of the agenda of the ASEAN and East Asia Summit meetings. The White House official also said the U.S. will make its own statement, and that it has encouraged other countries to do the same. "On the arbitration ruling, we have been encouraging individual countries to make statements in support of the ruling. But again, given the diverse views in the EAS, we didn't have an expectation. But we will make our own statements and we've encouraged other countries to make statements in support of the ruling," he said. The United States has repeatedly emphasized the legally binding nature of the ruling on the disputed maritime region and has urged urged China, which is a signatory to the U.N. Convention on the Law of the Sea, to abide by it. Beijing has rejected the ruling. "China's territorial sovereignty and maritime interests in the South China Sea" will not be affected, Chinese President XI Jinping said shortly after the decision was handed down.